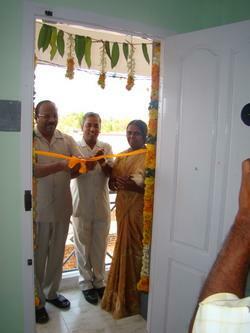 On March 1st Chinnasamy Rajendran, Director for India, along with a number of high level community officials and the head of the clinic Dr Mohideen witnessed the grand opening of the first ever Projects Abroad Village Clinic. The inaugural function went extremely well and saw more than 200 people including Projects Abroad volunteers and staff members attend the event. As such the Projects Abroad Village Clinic has quickly become the talk of the town with members of the local community expressing their sincere thanks to Projects Abroad director Rajendran. 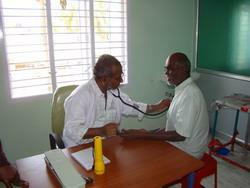 The aim of the Projects Abroad Village Clinic is to provide the local community with affordable health care. Based in Rayagiri, the clinic is situated in a region that faces a number of challenges commonly seen in rural areas of the state of Tamil Nadu. Health is one of the key concerns with preventable problems regularly seen in the hospitals and clinics. The cases are wide and varied and often include malnutrition, skin diseases and worm infestation. In rural areas children are often the victims of these easily preventable illnesses and adults also have other problems too, including abscesses, burns and cardiovascular diseases. With this in mind the new Projects Abroad Village Clinic aims to help prevent a number of these common cases and to treat others who previously may have gone untreated. Before the opening of the clinic these options perhaps would not have been available to some members of the community. Speaking at the grand opening Chinnasamy Rajendran, the Director for Projects Abroad was keen to express his views with regards to the benefit of this new health care programme for the local community. "We choose this area because there is a great need for it. Rayagri, in addition to being my place of birth, is in real need for good quality health care. It has a population of ten thousand, but being away from the main road, it lacks development in all fields. For a small ailment like a fever, cough or head ache, villagers have had to travel over an hour to a nearby town if they wished to get treatment." Projects Abroad already has a number of medical placements for volunteers in the Tamil Nadu District but this is the first time we are completely funding a clinic. As part of this new initiative the Projects Abroad Village Clinic doctor will be offering patients reduced rates on consultations, prices on treatment and medicines for the local people. The cost of check ups and treatment will only be a third of what it would cost in the Government Hospitals and will therefore be affordable for the local community. Rajendran explained the great benefits that the clinic would offer. "By offering reduced affordable medical aid provides us with a real opportunity to give something back to the local community. This concession is possible as Projects Abroad is happily meeting out the deficit every month." There is also an important role for Projects Abroad's own medical volunteers who will now begin providing valuable assistance at the village clinic. Here they will be required to take the blood pressure, temperature of patients, apply dressing to injured wounds, weigh the patients and give oral check ups. Those with more advanced medical experience will be able to give injections and other more advanced treatment. During this time they will be supervised and monitored by Dr Mohideen and Nurse Muthurani, who will assist, explain the various cases and help overcome the language barrier. 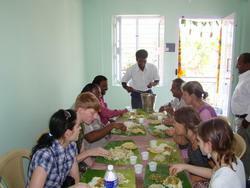 In addition, the Lab Technician Mr. Arulraj will help to explain to volunteers the workings of the clinic laboratory. Immediately after the opening ceremony the clinic began to receive patients. In the evening alone 40 patients were treated. The numbers are expected to increase over the next few weeks as news is spread about the new clinic. It will be something Projects Abroad and our volunteers are excited to be a part of.